Stacey Riddle, of Bellaire, Texas, is the mother of two daughters who were killed in a distracted driving accident in March 2016. A year has passed since our family changed forever. My daughters, 19-year-old Brianna and 17-year-old Jade, were so full of life, enthusiasm and love for the world around them. They were my babies and my only two children. I say “were” because on Sunday, March 20, 2016, my daughters were killed in a terrible crash that was the result of distracted driving. Brianna and Jade were on their way home from spring break on South Padre Island when the driver of their car lost control while checking her phone’s GPS. An 18-wheeler plowed into the rear of their car. Brianna was riding in the back seat and died on impact. Jade was the front-seat passenger and passed away several hours later. 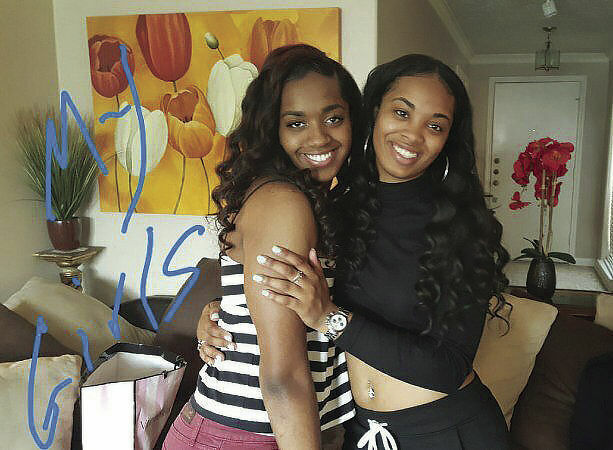 Their friend, Brittanie Johnson, was also in the back seat and died in the crash. The driver of the car was critically injured and survived. This was the first trip my girls had taken together without me. In the days after the crash, I kept waiting for the door to open and for them to come rushing in to tell me all about the trip, even though I knew they were gone. I miss my girls every day. I will never forget going to view their bodies. It’s a pain no parent should have to endure. It’s a pain that could have been prevented. This crash didn’t have to happen. Brianna and Jade Riddle were killed March 20, 2016, in a distracted driving accident while returning from South Padre Island. Brianna and Jade were just two of the 455 people killed in Texas last year in distracted driving crashes. More than 100,000 crashes in Texas each year are caused by some form of driver distraction, and the problem is getting worse. 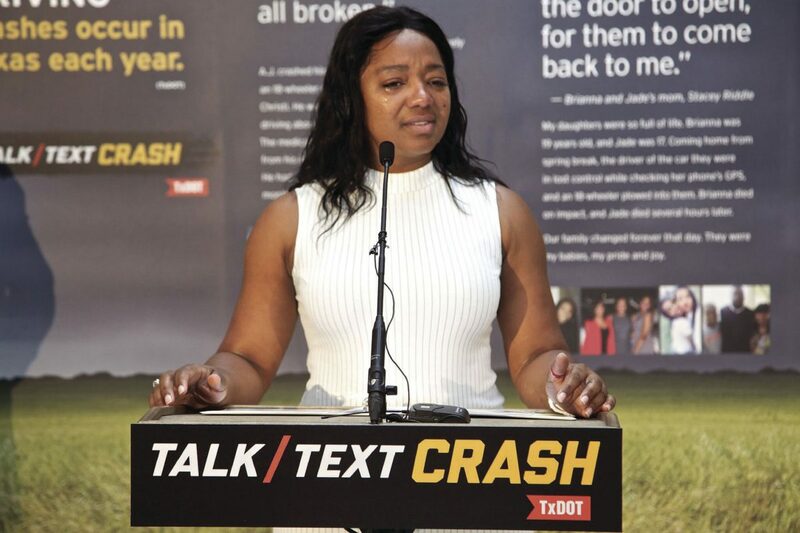 That’s why I am joining with other families who have seen their loved ones killed or injured in distracted driving crashes and sharing my daughters’ story as part of the Texas Department of Transportation’s “Talk, Text, Crash” campaign. A remembrance wall and exhibit with our stories is travelling to shopping malls across the state in June as part of the campaign. It was on display Thursday at the La Plaza Mall in McAllen. >> James Shaffer, of Denton, whose wife, Emma, and 12-year-old daughter, Tita, died in a crash last year caused by distracted driving. >> Arely Mathews, of Alice, whose 18-year-old son, A.J. Benavidez, was killed in 2013 when he did not see the truck in front of him stop because he was posting to social media while driving at a high speed. >> Jimmy Rincker, of Groesbeck, whose sister, Amanda, died in a 2015 distracted driving crash. Amanda also left behind two beautiful daughters, ages 5 and 6, at the time of the crash. >> Tyson Dever, who while a student at Texas State University was left paralyzed from the waist down after the distracted driver of a cement truck rolled his vehicle over Tyson’s car. Distracted driving causes one out of every five crashes in Texas. Those crashes are 100 percent preventable. When you text or check directions or look at your phone for any reason while driving, you’re not looking at the road and the vehicles around you. By the time you look up, you may not have time to avoid a crash. What if our loved one had pulled over to the side of the road before taking that call? What if the driver of the car who hit and killed our family member had waited to respond to that text? What if the driver had asked someone else in the car to navigate using the phone’s GPS? That is a question that still haunts me. What if? It’s comforting to know that even at such young ages, my daughters made a mark on this world. Brianna was an All-American athlete. She was truly gifted. Jade commanded any room she walked into and was a born leader. I am saddened when I think of all of the possibilities and all of the potential that will not be realized because of their tragic loss. As a mother who knows the heartache of losing her babies to distracted driving, I hope you will remember my story whenever you get behind the wheel. Pay attention when you’re driving. Put your cellphone and other distractions away and focus on the road. Too many people are killed or injured every year by distracted driving. Please don’t take chances with your life or someone else’s.